Mauritius is not just an island of dreamy azure seas and golden sands. Venture to the Indian Ocean republic’s capital, Port Louis, and it’s a lively place where people go about their daily business like any other. 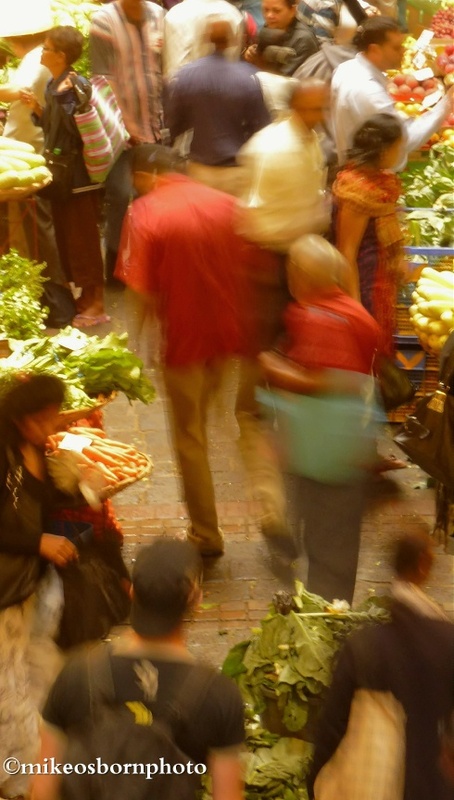 The central market is the place to visit, thronging with people and groaning with produce. Some of the floorspace is given over to Mauritian handicrafts made for tourists, and as a European visitor you’ll have several offers to visit stalls with vanilla, spices and fake t-shirts. 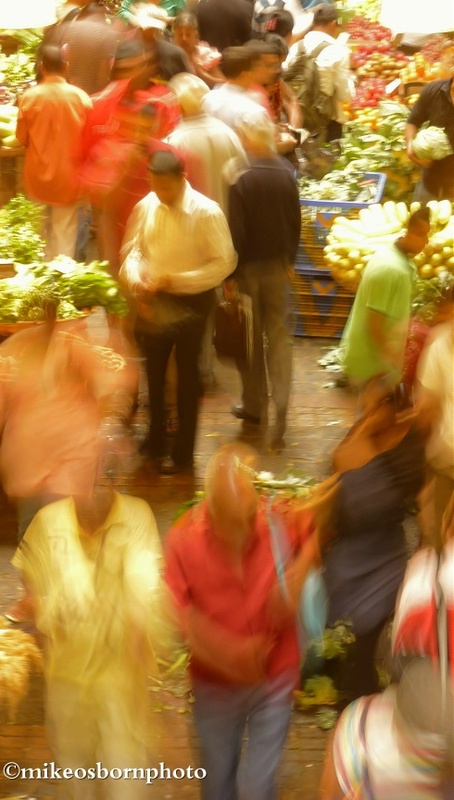 The fruit and vegetable market is an irresistible draw and bustling with activity. The two shots above show this frenetic life, smeared with colour and movement. 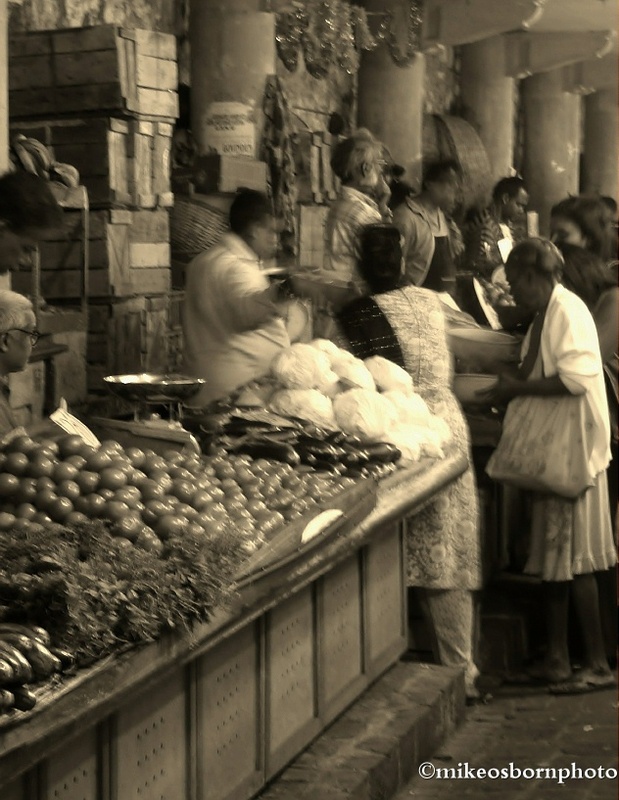 I chose a muted scheme for the photograph below, and like the story it tells – the stall on the left shows little movement apart from the owner glancing at his much busier rival. Why is everyone going to buy their goods there? Sometimes you only notice these little stories in a frame long after you have taken it. While I’m not always very comfortable with documenting life and people, sometimes the rewards are richer, wouldn’t you say? Thank you! Yes, I think they capture the essence of the market. But it’s far from my usual kind of shot. Much appreciated :-) Steering away from your comfort zone is no bad thing, maybe. Yes, I will. You keep very busy with your joint ventures – good idea. I should consider if myself.